Donkey Ollie Adventures are free because of the generosity of thousands of people who donate their sailboats, bass boats, ski boats, and jet skis from areas as far North as Kodiak, Alaska and as far South as Key West, Florida. With the funds Boat Angel & Car Angel have created various Donkey Ollie Programs some of which are available on You Tube as a 13 part TV Series. Tales of Donkey Ollie Books are printed in the USA and Ethiopia and now they aspire to fund additional printing for churches internationally. Boat Angel thanks everyone for Charity Donations of used boats. Visit their eBay store to help support their efforts. I was born in Bethany, Israel in approximately 28 a.d.. I have three older brothers who because of my small size and albino coloring never grew tired of persecuting me. I also have the ability to talk with humans and be understood. My first claim to fame so to speak was being picked by Jesus's disciples to give Jesus a ride into Jerusalem just a week before His crucifixion. In retrospect it was a bittersweet occasion that marked my life forever. My two young masters Elizabeth and Jehu were about the kindest humans anyone could meet and they had my most devout loyalty and indirectly were probably the reason my life was so full of excitement. I had this series of adventures recorded to give the children in the twenty-first century an idea what life was like in the first century and even more than that I wanted them to know that no matter what dangerous circumstances they found themselves in Jesus was always there to help. I am happy that thousands of children have enjoyed my recorded adventures but like all aspiring thespians my heart longs for the silver screen. Yes someday I want my own star on Hollywood Boulevard next to Donald Duck and Mickey and Minnie Mouse, as well as the hundreds of other animated characters who have come to life both on the silver screen and in the hearts of children everywhere. My adventures covered years and took me all over the Roman Empire which when I lived was pretty much the ruling power. I have been rescued from lions, shipwrecks, kidnapping and along the way I have made some great friends and really seen that God is always faithful and always answers prayers though not always in the ways we expect Him too. My creator, Brian Stewart, allowed me to be born out of his fertile imagination and nurtured me to maturity desiring that the many children he met would have a chance to get a firsthand revelation of the love and faithfulness of God as they saw the world through the eyes of lowly beast of burden upon whom God smiled. These award winning movies are now available for your church, bible school camp, etc and take it from me kids will listen and appreciate the stories because it is coming from the horses...cough...em...donkey's mouth. Ollie and his sweet little face and big expressive eyes and his donkey brothers love listening to stories especially the one by Aunt Alana who tells them how she was chosen by Mary to be THE donkey to bring them to Bethlehem for the birth of Jesus. She also tells them that no matter how small or what family you come from God has used donkeys to help him do what needs to be done for generations. Ollie is different, he is a white donkey with white blonde hair among brown donkeys with light brown hair AND he wants to be the chosen one that brings Jesus to Jerusalem. Alana tells him that God looks at people's pure heart and that he shouldn't listen to anyone who bullies him or tells him that he isn't worthy. The stories let children know that they are special. No matter what differences they may have or whatever they feel is their shortcoming, God created them and they are special. God doesn't make mistakes and you are exactly who you are supposed to be. The messages and songs are what kids and even some adults need to hear. God chooses those with wiling hearts and if you keep your heart with God you are special no matter what anyone says. I give this DVD a 5 out of 5 stars. As far as videos go the animation is 3D and the messages, stories, and songs are good, kid friendly and not preachy. To request DVD's for your organization, school, or yourself go to Donkey Ollie's Free DVD's . To keep the cost down this is for US residents only. 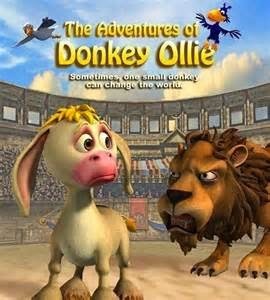 A video clip of Donkey Ollie. Disclaimer: I received samples for my honest opinion. No monetary compensation was offered or received.